This park was founded in 1995 and is the second largest Natural Park in Spain It was originally a protected Hunting Reserve but in 2001 became a Nature Reserve with half declared as a Natural Park. It is made up of Calcareous Mesozoic rock formations creating many peaks. The highest peak being Mount Caro approx. 1447 metres. 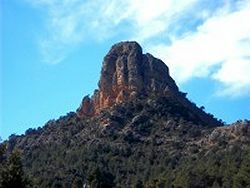 There are others which include Hillock of the King 1356m, The Negrell 1343m, Millstone of Cati 1326m, Punta Torroja 1246m, naming just a few. 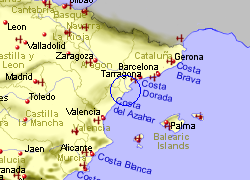 The Els Port Park is situated close to the Mediterranean coast where it rises at the far eastern end of the Ebro 200 kms SW of Barcelona. 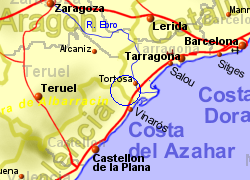 The total area is 60,000 hectares and the mountains spread into three Spanish territories, Catalonia, Aragon and Valencia. 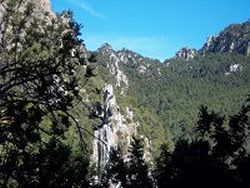 The landscape is wild and rugged and there is an abundance of wild life such as Ibex (cabra hispanica), wild boar, badgers, polecats, foxes and squirrels. Among the many species of birds, vultures and golden eagles can be seen gliding on the thermals overhead. There are umbrella pine and beech trees on the higher slopes and a variety of colourful flowers provide cover in the spring and autumn. 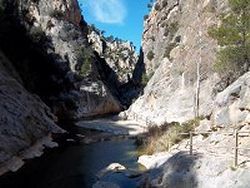 A good way to access the north west side of the park is via the Via Verde (The Green Way), a tarmac path that runs on the old railway track from Tortosa, following the river Ebro at first, then turning north into the hills, past the warm springs and old sanctury of Fontcalda, to the village of Arnes. The path is used by walkers and cylists, through stunning scenary and a total of 40 tunnels (which are lit), and can be accessed at various points where there are limited car parking and picknic facilities. This area is a great favourite of Bird Watchers and Walkers. 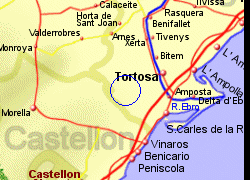 Map of the Els Ports Natural Park area.